Trying to keep things in there place while traveling in an RV can be a challenge and that especially holds true for the kitchen area. If your traveling with a trailer you probably cringe when you hit that big bump or that crazy entrance to a gas station. And when your in a motorhome you get the unpleasant sounds to go with the calamity that is occurring in your draws, cupboards and on counters. So we thought we would feature a few RV accessories that will help keep dishes, cups and silverware in there place. When it comes to keeping silverware in place, one item that our we find indispensable is the Camco Adjustable RV Cutlery Tray. Unlike other trays, this one is capable of being adjusted and locked into place. So even if the silverware drawer pops open on a wicked turn, the cutlery shouldn't go airborne. Each one can fit into drawers that are anywhere from 9 inches to 15 inches wide and 10 6/8 inches in length. If you need a narrower model, you could go with the standard Cutlery Tray instead. It is 7 inches wide and 11 inches long but doesn't adjust or lock down. Therefore, to keep the tray from sliding about you may want to pair it with Rock-N-Roll Motion Proof Putty, Velcro Hold Down Tabs, RV Designer Drawer Locks or Industrial Strength, Sticky Back Tape. Whether your traveling with little ones or just like to stay organized we’d also recommend the Knife Safe. 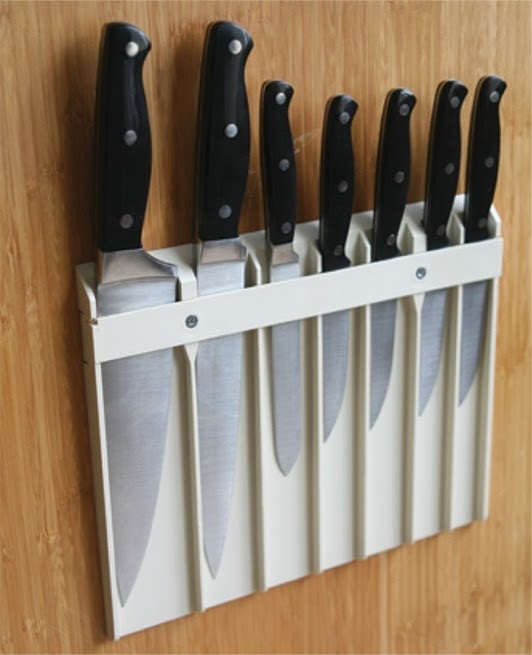 It is designed to hold and separate the knives in a way that keeps them sharp and secure. Simply affix the safe to a wall or the inside of a cabinet. Then slide your knives into the designated holes and hit the road. From large and small plate holders to refrigerator bars, we have all types of RV accessories to keep your kitchen from becoming a disaster area while traveling to your favorite campground. Check out our RV kitchen accessory category for hundred's of items designed to keep you organized. 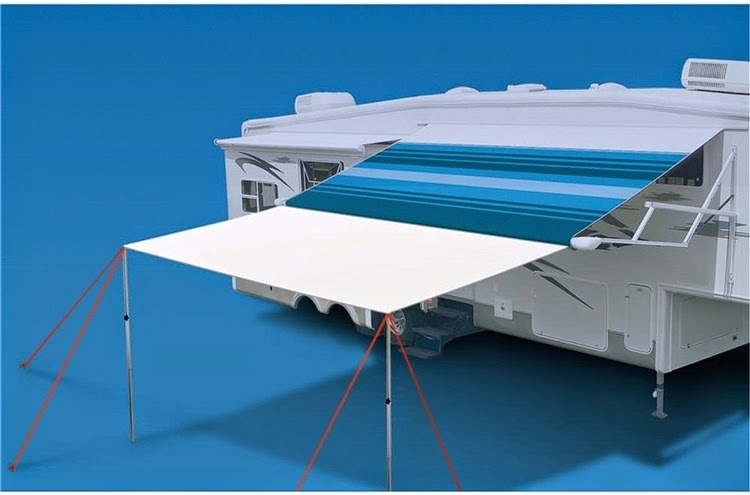 There are times when the size of the awnings on your motorhome may not be sufficient. Weather may be a factor, especially if its particularly sunny and hot, and you need additional shade for protection. In some cases there may be more people present than your current awning can sufficiently accommodate. The Carefree of Colorado RV Canopy Extension will provide you with the additional space and shade that you need. The Carefree of Colorado RV Canopy Extension gives you an additional 8 feet of coverage beyond your existing awning and can be secured to the ground so it stays in place. Installation is simple and does not need to be handled by a professional. When not in use, the canopy is easily stowed in the included storage bag. The various widths ensure that there is a canopy available to fit the size of your awning. Widths range from 12 to 20 feet. It is able to work with manual as well as 12V awnings. The white color will reflect the sunlight and help to keep things cooler. It is hemmed on all sides, so you don’t have to worry about the fabric wearing out or fraying on the edges. Besides being able to give you additional shade, the Carefree of Colorado RV Canopy Extension also increases the amount of space for an outdoor living area. In giving greater protection, it gives you more opportunity to enjoy the outdoors and make the most of the surrounding area. weatherman's favorite term this year is a "polar vortex" is on it's way again. But March is just a few days away and the time change is on the 9th this year, so the countdown is on! Getting ready for the season should start with a detailed list of items that require maintenance, repair, upgrading and cleaning. Spreading the cost of those items over the next few months prior to your first outing is always easier on the pocket book than waiting until the last minute. So if your RV has been in storage all winter, and you haven't stopped by in a while, it's time to grab paper and pen and pay your lonely RV a visit. If you need a little help we have made an RV Spring Checklist that covers all of the areas of your RV that may need maintenance. Now that you have your checklist covered, I thought I would review some RV accessories which are perfect spring time projects that will help maintain and possible update your RV for a trouble free camping season. What's more important that a complete and thorough inspection of your trailers running gear? Brakes, bearings and suspension components all require continual maintenance and upkeep. Lippert makes replacement brake components for most trailers in the popular sizes of 10" & 12". You'll find complete brake assemblies down to individual components to keep your trailer under control while stopping. Over the past few years it has come to light that more and more trailers owners are running into worn suspension components such as shackles and bushing sooner than they feel they should. To rectify the problem, Mobile Outfitters designed their Never Fail Bushing kits and MorRyde developed a line of heavy duty suspension upgrade products that deliver piece of mind to trailer owners. Keeping water out of your RV seems like a never ending battle and why you should really take a close look at every seam, joint, vent and skylight. Not that I am big into astrology, but it does appear that my sign (Pieces) seems to attract water. I have first hand knowledge on roof leak repair in various RV's that I have owned and until the introduction of Eternabond Leak Repair tape about 6 years ago they did not go well. Eternabond is a miracle, well actually a microsealant in tape form, and when properly installed it is a permanent solution to sealing all of those areas RV manufacturers love to create to make leaks possible. The beauty of Eternabond is that it works on all RV roof materials such as rubber (EPDM, TPO) fiberglass, aluminum, galvanized steel and more. Lapp sealant is great for short term repairs, but if your looking to solve the problem for good, then look no further than Eternabond. The last thing I wanted to mention was RV lighting, which reminds me that I have a G4 style bulb out under a cabinet. With LED's on the fast track to lighting up our world, we have seen some real advancements for RV's. Replacement RV LED light bulbs are fast becoming the bulb of choice when updating the lighting in an RV and I can see why. They last forever (30,000 + hours) they have become much brighter, don't get scalding hot like standard bulbs, use less energy, deliver softer light, and are available in just about every configuration a standard bulb is available in. Since they are pricey'er than standard bulbs it is sometimes best to just replace the bulbs you use the most with the LED's and leave the others alone until they burn out.. Taking some time to properly prepare your RV for the upcoming camping season will ensure you are ready to travel this spring. 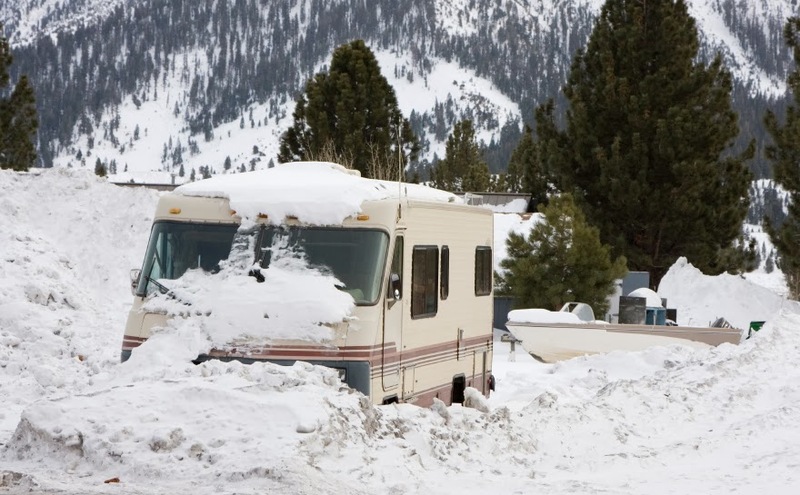 Even though that polar vortex hasn't headed back north just yet, now is the time to gather everything you will need to prepare your RV once it’s taken out of winter storage. If you are one of those RV'ers that likes the idea of free electricity and living off the grid, I am sure you have begun investigating the various solar options available. I'll admit when I first began to see solar move into the RV industry, I was lost. It seemed as though many companies made it appear like solar was so advanced that only a rocket scientist could configure a system. But after sitting down with some of the solar manufacturers that we supply products for, the fog lifted and I could see this really is not as difficult as some would have you believe. Although, there are many factors that need to be determined when configuring a system, and this is often where most people get tripped up. So where to begin? Usually the first question RV'ers ask when they are looking into solar is "how many panels do I need to power my RV?" 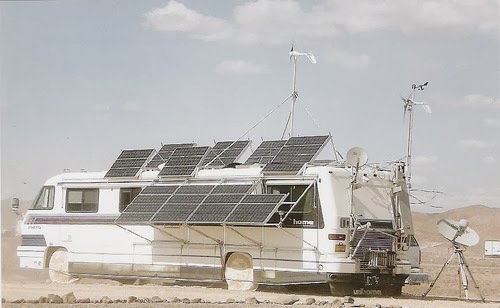 Once it's realized that the solar panels don't power the RV, but battery(s) do, there is usually a split in the type of solar user one becomes. With such factors as the amount of power that will be used, for how long between charging cycles and how any batteries there are to hold that power, conserving energy in your RV gained new meaning. There are a number of sites with calculators to help you figure this out such as this one from Salmex Solar. Usually after that wake up call RV'ers look for something a little more simple to possibly just maintain their batteries while the RV is not in use or short weekend boon-docking trips. And with the advent of portable solar systems this and other smaller charging jobs just became a whole lot easier. Here are a few portable rv solar systems that you’ll want to get familiar with before this years camping season begins. cart battery. This system is compatible with flooded, sealed AGM and gel batteries and comes with load control setting features and status indicators. Thus, compatibility and over charge problems won’t need to be a concern. Set-up and storage are worry-free endeavors too. 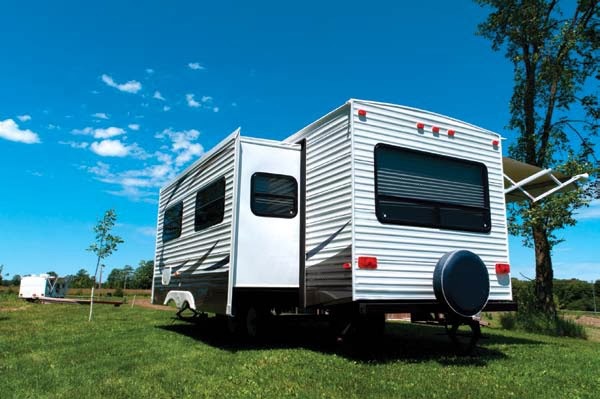 The camping trailer accessory is just 19.9 inches wide, 2.8 inches deep and 32.5 inches tall when closed. 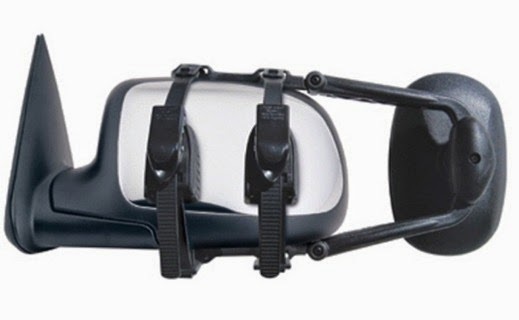 And it fits into a durable carrying case that can hold all of the set-up essentials. As such, in most instances, set-up will take you less than 10 minutes from start to finish. The PSK-120 isn’t the only portable solar panel kit available on the market today. There is also the Nature Power Portable folding systems as well as Samlex portable systems. 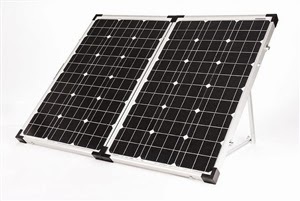 To learn more about these portable solar panel kits and other green energy powered camping trailer accessories, please contact us at (866) 332-7881. We can help you choose from a wide variety of solar options including trickle chargers, battery bank charging stations, awning lights, flagpole globes and much more. It seems like yesterday that I first remember seeing a power operated slide out in a motorhome. I was definitely hesitant to purchase an RV with one, since every other comment on RV forums such as iRV2.com was not a good one. Leaks were the most common problems, but mechanical issues weren't far behind. Even though they have improved considerably over the years, they still have there issues. Many RV'ers that we know have a love-hate relationship with their slide-outs because of the extra room but hate dealing the break downs or leaks. The good news is you can typically find all of the items needed to fix common hydraulic and electric slide-out problems you may have in our slide out repair section. Before filling your shopping cart full of parts you always want to rule out the obvious. 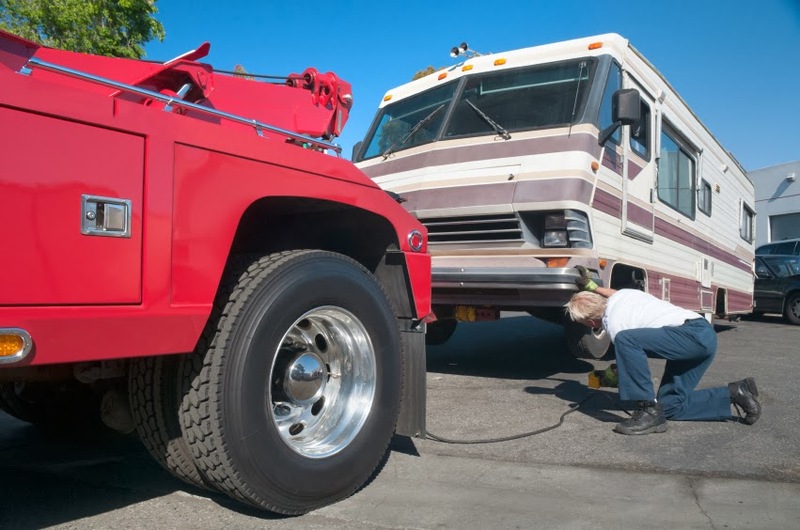 For example, it is not uncommon for a blown fuse, damaged wiring, faulty circuit breakers or a weak battery to cause a motorhome’s slide-out to malfunction. Therefore, you may want to at least stock up on spare fuses and invest in a battery charger, maintainer or tester. That way, you can check those areas of your RV first and quickly resolve any problems on the spot. Early on in slide out history it was pretty common to have hydraulic slide outs in a motorhome utilizing the same pump as the hydraulic leveling jacks. In these systems the most common issues are corroded solenoids or battery connections and pump or cylinder failure. So you may want to check those items first. Now that electrics have become more reliable and stronger, electric slide outs have become much more popular. They feature a much more light weight design and generally easier to repair. On RV’s equipped with electric slide-outs, it could be that the shear pins or motor and gearbox are to blame. They aren’t the only potential, problematic areas either. Thus, other items that you may need to pick up to complete a slide-out repair are reversing solenoids, roller assemblies, sealant, switch and actuators. To avoid having to deal with slide-out problems in the first place, make sure that you utilize items like Lippert Slide-Out Slickers and Lippert Components Patented Triple Flex Guard Kits. Together, they’ll help protect your slide-outs during normal, everyday use. It’s also a great idea to routinely check the system’s fluids and seals as well as remove dirt from the slide-outs’ undersides. And last but not least, make sure that you don’t overburden your slide-outs at any time. Otherwise, you could end up having to manually retract an extended slide out just to get home. To learn more about how we can assist you with keeping your motorhome’s slide-outs problem free, please contact us. Our RV part supplier experts are standing by to answer all of your slide-out related questions. Spaces like closets or overhangs sometimes require additional brightness in order to see things properly. Installing a light fixture can be a complicated process, especially if you also need to install or configure on/off switches. The Diamond Group LED Slimline Touch Light is able to take care of those issues by providing light where it’s needed. As an added convenience, the light can be toggled on or off just by touching it. The Diamond Group LED Slimline Touch Light is easy to use, can be used inside or outside and is easily mountable. The cover conveniently hides the screws used to attach the light to a wall or other flat surface. Because it uses LEDs, it remains safe to touch and comes with all the benefits of using LEDs, including a long lifespan and efficient energy consumption. The touch feature toggles between on, dim or off to provide you with the proper amount of light you need. The 5500K daylight color gives off a bright white light in wide 120° spread. It is also compliant with an IP66 rating, meaning it stays protected against exposure to dust or water jets. 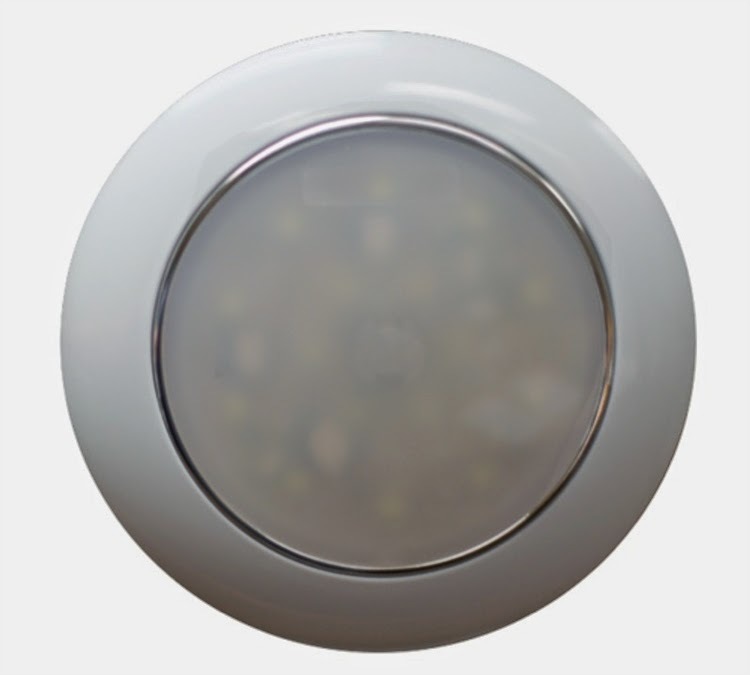 The Diamond Group LED Slimline touch light is circular and is available in 3 sizes to fit your needs, with 3″, 5″ or 7″ diameters. It can bring light to your RV where the amount of sources may be lacking, while the touch feature makes it safe to use for everyone. Entering and exiting an RV is not always as straight forward as it would seem. The ground surface is always changing as is the height of the lowest step. Imagine what would happen if you slipped and fell while getting into or out of your motorhome or camper. No one wants the fun to end due to an accident, the positive news is there are RV accessories available that can help you step safely. 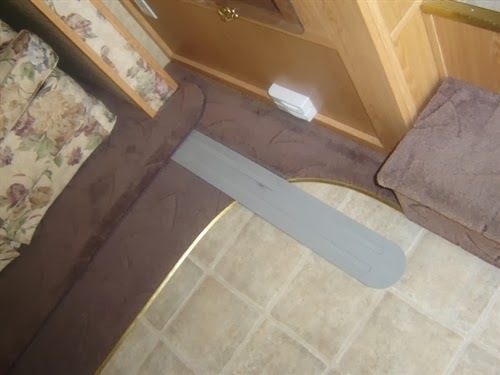 One RV accessories that can strengthen your chances of safely entering and exiting a motorhome are step stabilizers. Step stabilizers, also known as step braces, are designed to go underneath of the step’s frame and keep it from moving during use. There are several companies that manufacture step stabilizers. Two that work well are Camco’s Sav-A-Step Braces and Leisure Time’s RV Step Stabilizer. Both install easily and can be adjusted to accommodate the steps’ height. The tallest one available is the Camco model. It can go up to 14 inches in height whereas the Leisure Time model only extends to 12 inches. Self-illuminating steps are another RV accessory that can improve entrance way safety. Many of the self-illuminating steps are designed to be attached directly to the RV and feature built-in LEDs or anti-slip glow tread. However, there are basement glow steps that have the same features but are designed to be placed onto the ground. One company that makes self-illuminating steps in various sizes is Torklift International. Their product line ranges from the basement camper steps that we mentioned earlier to six step models. The firm also manufacturers RV accessories designed to go with them. Examples include boot cleaners, riser guards, glow-in-the-dark handrails and safety locks. If replacing the RV or camper’s steps is not an option at this time, there are other RV accessories to consider. Among them are anti-slip strips, tape, tread and traction carpeting. The strips, tread and tape come in both standard and glow-in-the-dark models. The carpeting tends to be without glow-in-the-dark capabilities. However, they can be modified with the aid of the glow-in-the-dark products that we mentioned previously. Companies that produce such products are InCom, Kwikee and Presto-Fit. EZ Open Handles are the last RV accessories on our entrance way safety list. The handles are designed to enable campers to open their motorhome doors prior to ever setting foot onto the RV’s steps. As such, there is less of a chance that campers will fall backwards or slip while trying to get inside of their motorhomes. The company that makes the EZ Open Handles is Stromberg Carlson. To learn more about these RV accessories and other products designed to improve the safety of a motorhome’s entrance way, please contact us. 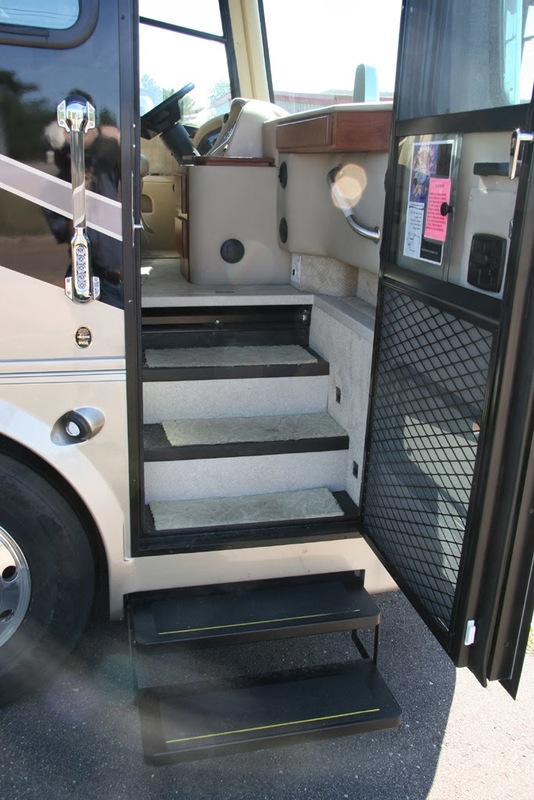 At RV Upgrades, we carry an array of platform steps, entry steps, step covers and repair parts. I always get chastised by friends and family when I mention I am going camping. "Traveling in an RV is not camping" I am told over and over again. O.K. so I am going RV'ing, for some reason that just doesn't sound right. Those of us who enjoy camping in our RV's (better), like the fact that we get the best of both worlds, all the comforts of home in out of the way places. But many of those out of the way places have very hard well water and a reason why a portable water softener for your RV should be on the top of your RV accessories list. There is nothing worse than taking a shower and smelling worse than when you got in. Hard water many times leaves has a rusty smell and is a primary reason why RV'ers consider a water softener for their RV. Other great benefits is the elimination of hard water spots on shower doors, dishes and fixtures better tasting water and it's easier to rinse dishes and your body without leaving behind soap residue. When you are camping with your RV, you don't want to bring along a lot of heavy, complicated accessories. Recent updates in RV water softener design has left us with very compact and lightweight units that are easy to transport and setup. When you reach your campsite, you simply attach the incoming hose to the water spigot at your site and the outgoing side to your RV's water hose. It's that simple. No extra tools required. It may seem as if the cost of a water softener for your RV is out of your reach. However, the operation costs are relatively low. In fact, these softeners use regular table salt, which means you don't have to purchase special salt when it's time to regenerate the unit. In addition, the reduced wear and tear on your RV will help you protect your investment, saving you even more money in the long run. Camping doesn't have to mean living off the land in a nylon dome. Having 2 solid walls and a roof around you tends to make more sense in this day and age and so does having good water. With the addition of a portable water softener in your RV, you can experience the comforts of soft water while "roughing it". 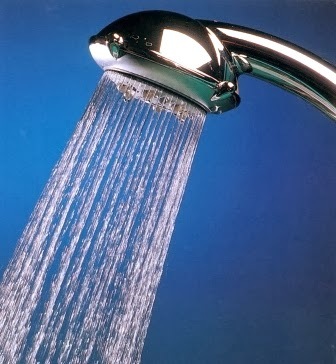 Share your thought on RV Portable Water Softeners through our comment section. Having background music when entertaining outdoors adds to the overall atmosphere of a get-together. This can become a hassle, however, if you are worrying about possible weather affecting your sound system. Likewise if you are going on an RV trip, you want to make sure the components of your sound system can stand up to the stresses of traveling. 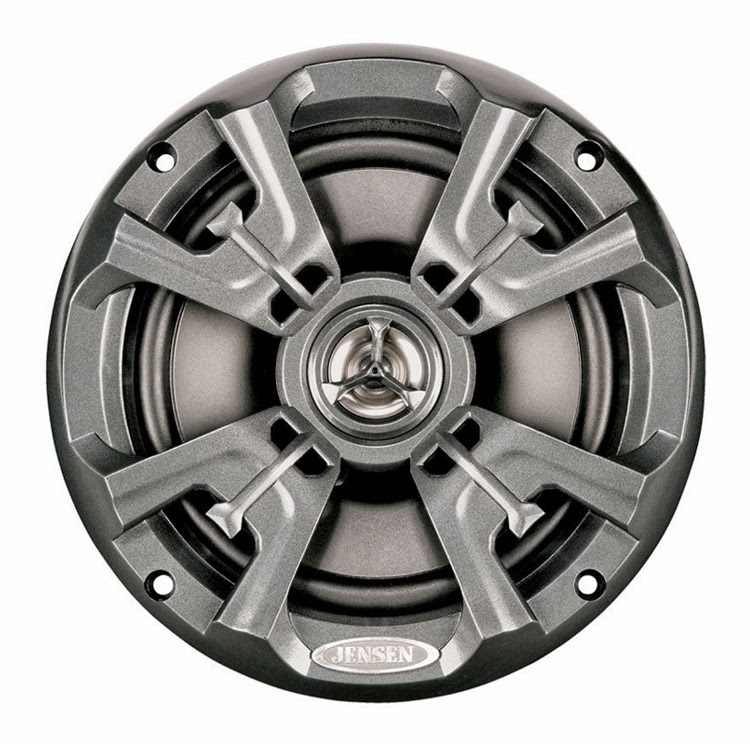 The Jensen MSX60RVR Coaxial Waterproof RV Speakers are made with these aspects in mind. They can be used not only in a motorhome or RV, but also work well in boating and marine applications. These speakers feature several characteristics that help them withstand exposure to the elements. Besides being waterproof, they also have UV protection and resist corrosion from salt spray. These speakers can be used inside your RV when you wish to perfect your interior sound system. The Jensen coaxial waterproof speakers are subjected to a number of various tests to ensure their quality, and are designed to hold up against possible vibration as well as extremes in temperature. They have a large 6.5" diameter and have up to 75 watts of power. The Jensen MSX60RVR Coaxial Waterproof RV Speakers are made to last and will allow you to add to the enjoyment of your sound system. Being coaxial speakers, they are also easy to mount and the sound coming from them is easier to manipulate. Coming in pairs, they can provide a stereo sound to your electronic devices. So many RV'ers neglect to check the tire pressures in their motorhome each and every trip. 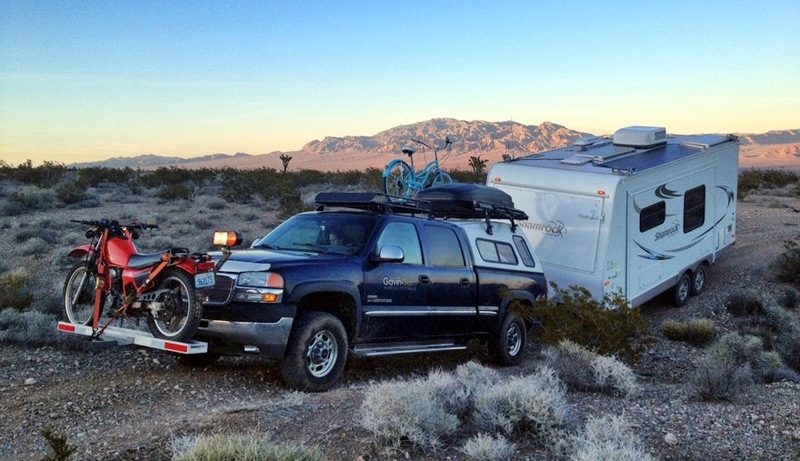 Unlike cars and SUV's, motorhomes tend to be loaded to the max capacity rating of the chassis and tires, leaving a dangerous situation when tires are not properly inflated. This is why it is critical to check those pressures to ensure that they are set to the manufacturers recommendation for the weight of the motorhome before heading out on the road. 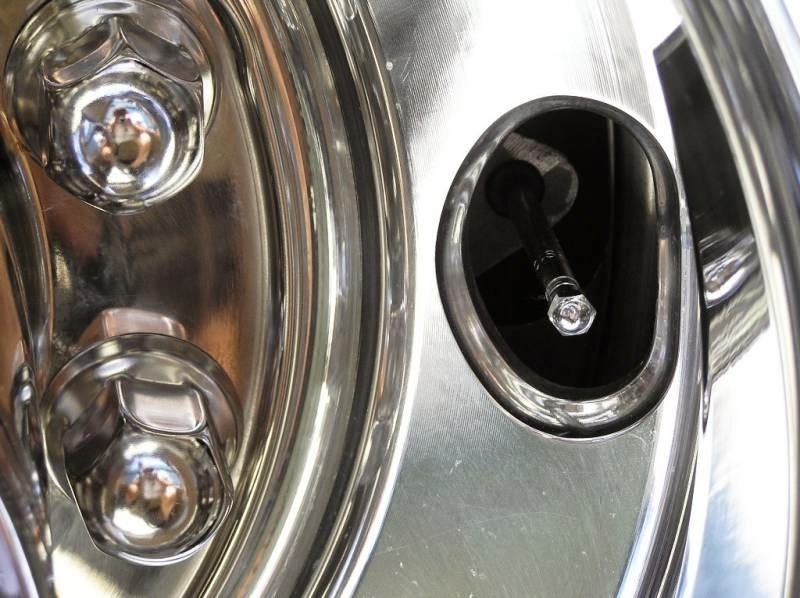 Many times this can be a real chore with motorhome accessories such as stainless steel wheel liners in place and that is where a good set of valve stem extenders will make all of the difference. Valve stem extenders are one of those motorhome accessories that many newbies often overlook. Designed to affix to your RV's tires, we think that they are one of the best tire maintenance tools going. Once they are in place, you’ll be able to effectively and efficiently maintain your motorhome tires’ air pressure. And we all know how important that is! There are a few things that you must keep in mind about valve stem extenders though. To begin with, not all of them are the same. They come in different lengths, materials and styles. Some are meant to be used with specific valve stems. Others are designed to be universal. So you can’t just pull one off of a store’s shelves and slap it onto your tires without doing a bit of research first. Otherwise, you could end up with that dreaded flat we mentioned or worse yet, a blow out. Therefore, before making a purchase, look at your tires first. Check out such things as the existing valve caps, cores, stems and rims. You can use a drinking straw and a ruler to determine what angle and length the valve stem extender should be. There are complete kits with hoses included for the rear dual wheels if your motorhome is so equipped. Hoses are available in rubber or with Stainless Steel over-braiding for added protection and have various mounting brackets depending on the type of wheels are on your motorhome. If you still have questions about valve stem extenders, please feel free to contact us at (866) 332-7881. Our RV Upgrades team is well familiar with all of the different valve stem extenders and would be pleased to make recommendations. Towing a vehicle such as a trailer or camper can render your existing side mirrors useless if it ends up blocking your view. Oftentimes you need a larger view so you can see what is going on around you, so backing up or switching lanes can be done much more safely. 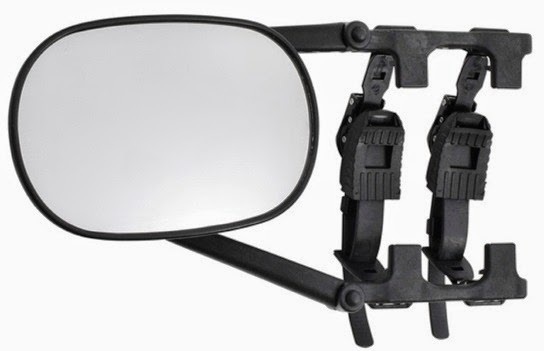 To that end, the KSource Universal Strap-on Towing Mirror solves those issues by adding the necessary view without requiring you to install different mirrors on your vehicle. The KSource Universal Strap-on Towing Mirror clamps on to the mirrors for almost any vehicle and works on both the driver or passenger side. Once attached, it will not impede the view of your existing mirror. The large reflective surface ensures that you have the extra view you need to see past your towed vehicle. The mirror can be adjusted to create a proper fit and features a ratchet lock so it stays in position. By working with your existing mirrors, the KSource towing mirror saves you the time and expense of needing a custom fit mirror for your vehicle. This towing mirror can also be removed for storage when not in use and has a lightweight design. 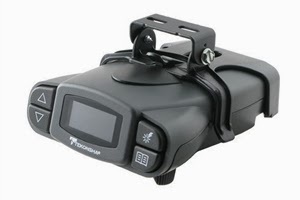 Using this KSource universal strap-on towing mirror makes creating a safer driving experience when towing much easier. The simplicity of its use also makes it an ideal accessory during a camping trip when needing to tow a trailer behind you. A safer trip also adds to your peace of mind while you are on the road. If you have owned an RV for any length of time you know that the lighting inside your RV is not always ideal. The fixtures they use are often very basic and offer no style and very little light. While many people are perfectly content keeping the lights as they are, you maybe one who wants to make changes to the interior lights in your RV. There are several reasons why updating the lighting in your RV can make all the difference at night. Whether you purchase a used RV or you simply want to change the look of your new RV, choosing new interior lights is a minor change that can make a major difference. Choose light fixtures that reflect the overall style you want your RV to have or pick a different type of light that will disperse the light in a different way. RV's tend to have a limited amount of natural light that enters through windows leaving the living space uninviting. By using different types of RV light fixtures to create a bright space, having to hang out in your RV on those cold or rainy days will be much more enjoyable. No matter what the reason or which fixtures you choose, you can make your camper or motorhome your own with new lightening. Most campgrounds don't charge for actual electricity use, but rather charge a set fee for the use of their electricity. However, this doesn't mean that RV owners don't want to do their part to save energy and the environment. You can now purchase and install RV interior lights that use LED bulbs to give you the light you need without using as much energy. These fixtures are a great addition to your RV even when your not hooked up to campground power, saving your RV's batteries while off the grid. Have you procrastinated in replacing that broken fixture? Depending on the amount of use and other wear and tear factors, you may need to replace your fixtures because they no longer work properly. In these situations, it's a perfect time to upgrade to a more modern or functional light fixture. 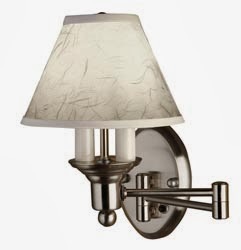 Gustafson Lighting makes all types of RV replacement light fixtures including; ceiling lights, wall lamps, reading lights and cosmetic lights. Many RV'ers simply settle for the fixtures in their RV because they either don't want to take the time to change them or they don't realize they can. However, there are many RV interior lights that can be used to update the look of your RV, save energy or replace broken fixtures. Regardless of the reason, there are many choices for your interior lighting. If you are interested in changing the interior lights in your RV for any reason, contact us. 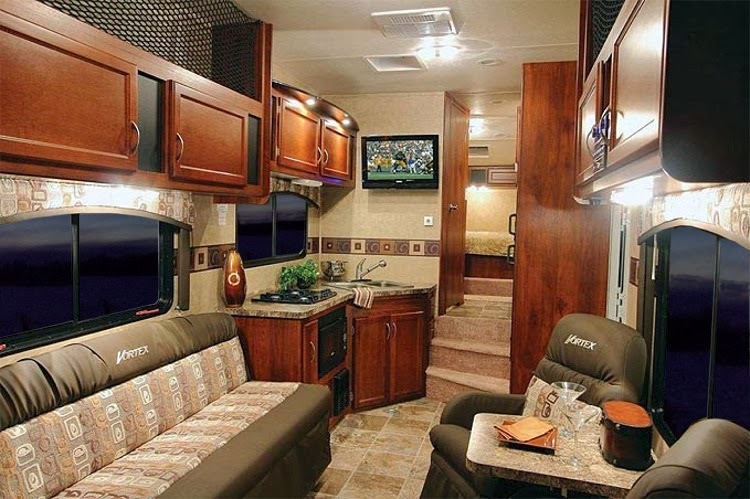 We offer a large selection of RV interior lights, as well as other RV accessories. 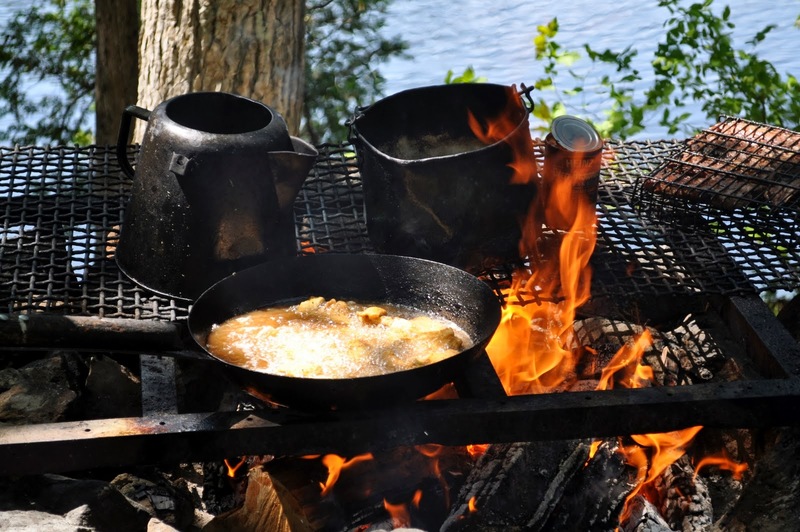 Part of the fun of traveling in an RV involves cooking food outdoors. The first few years we camped I thought a campfire was only for sitting around during the evening, keeping warm and cooking marshmallows over. I just assumed it was way to much work to try and actually cook a meal over until we camped with a group at a mini rally. One camper pulled out a slick little adjustable grill and the food we ate that night from the campfire was amazing. In the almost 20 years since that camp-out we have almost exclusively used a campfire to cook over. And remember, cooking over the fire doesn't necessarily require a special grill, a cast iron skillet and a metal grate will get the job done. But if your looking for something that can be stored away easily then we just might have the right RV Accessories to get you fired up! If your looking for something simple to cook a few burgers over and get that campfire cooking career going look no further than the Pioneer Camp Grill. This super lightweight and very portable grill has folding legs and a nickel plated chrome finish for easy storage and cleanup. But if it's real functionality you desire than I recommend the CampfireGrill series of products. The Original; with it's raised sides, 20" x 25" grilling surface and adjustable grill height is the perfect choice for a camping family. We have used this type of campfire cooking setup for years and love it's flexibility and ability to raise or lower the grill depending on the temperature of the fire. Grill baskets are another great accessory for cooking fish, vegetables, even steak or chicken. Some people don't give pie irons the credit they deserve, these little cookers can serve up some great recipes. We use either a Rome Double cast iron cooker or the Panani press with some fresh italian bread or bagel our favorite lunch meat, tomato, some cheddar cheese and some hot pepper relish. I can't tell you how good that sandwich is! And don't forget desert. Create delicious S’mores over an open campfire without the mess by using a Rome S'more maker. With this device, you can make up to three S’mores at one time by placing graham crackers, chocolate, and marshmallows in the device and then clamping the top of it down firmly. Hold over flames until the chocolate and marshmallows have melted completely. Use caution when removing the S’mores, as their marshmallow filling can be especially hot. Even breakfast can be tackled over the fire, just spray the Rome 1405 cast iron waffle iron with some non-stick spray before adding waffle batter. Add a grate over the top of your campfire, and then place the waffle iron in the center of the grate. Cook for three to four minutes, and then flip the waffle iron over. Remove whenever the batter has cooked completely through and waffles are lightly browned around the edges. After using these cooking tools for some time, you might just find you where a closet campfire cooker and didn't even know it. To purchase these or other RV camping accessories, visit the store or contact us. When entertaining outdoors, you may want to add a touch of style to your outdoor living space. Other times, such as during a camping trip, you may also wish to bring a touch of home along with you. Reversible patio mats may just be the solution you are looking for. They can define your space as well as create a look for your outdoor living area. They can also provide an added safety factor in the event that you wish to avoid contact with the bare ground. The type of material for an outdoor mat can be a critical factor in choosing the right one. You need to make sure the mat will stand up to the amount of use and weather it will be exposed to. These reversible patio mats are constructed from polypropylene, so they are made to stand up to the elements and various environmental conditions. The design of the weave makes them easy to clean and quick to dry off. They are easily portable and foldable so they can be quickly stored in a small space. The reversible patio mats are also able to be secured in place, eliminating any concern due to harsher conditions that may be encountered. Using reversible patio mats will present a more cohesive appearance to your outdoor space. These patio mats come in a number of sizes and styles to fit your preferences. All designs can be used on either side, creating two looks and allowing you to switch between them. I am always amazed when I see a dog owner fail to pick up their pets waste. I still remember like it was yesterday, Michelle and I packed up the camper along with our two kids to escape from a cold Ohio winter. After two days of driving we finally arrived at Tropical Palms campgound in Kissimmee Florida and could not wait to get out and feel the sunshine. Parked in our campsite we all piled out of the motorhome and within seconds I could hear screaming from the other side of the RV as I tried to plug in our electric cord. I made a mad dash slipping and sliding to the to the other side to see all three of them standing there with one foot in the air. Dog poop! It was everywhere, I even stepped in it with both shoes as I ran over to find out what was going on. By the time we cleaned things up we had picked up over 10 piles besides the ones we stepped in on our site. We could of gone up to the office and complained and probably should have, but we where so excited to be out of the snow we just laughed it off as another adventure in the trip. We watched as a few of the neighboring dogs roamed free to do their business during the remainder of our stay with not a care from their owners. We did not own a dog at the time, but talks where already under way as to just when we would. This was the perfect lesson for the kids to learn on how not to care for a dog while camping. It's always wise to carry a roll of pet waste bags that are attached to the dogs leash. If your a bit squeamish you can try this handy pooper scooper that we have seen many people outfit with a plastic bag on the end to easily pick up dog waste. Our two dogs love to walk, I must circle the campground at least 5 to 6 times a day and at least once during a weekend stay an unleashed dog runs out to greet us. Generally everyone gets along until the dog owner arrives yelling at the dog to come and it completely ignores them as if it never even heard that command before. Occasionally, a dog becomes very aggressive and having many years of experience I have learned how to keep things relatively calm until the owner gets there. They are always apologetic and explain that the dog never leaves the camper and they don't understand what got into them. As much as we would all love to think our dogs are the best behaved and obedient, it is always wise to error on the side of caution and keep your dog under your control at all times. We are finding more and more private campgrounds are requiring a copy of an up to date vaccination record for each dog and now we see some state parks requiring this information as well. It is also a good idea to review a campgrounds pet policy and regulations before booking a campsite. There are now limits as to the number and breed of dog(s) aloud to stay at campsite and for good reason. Some of these places can get very crowded, especially on holiday weekends, and the dog madness can turn a campground into a camping nightmare. As much as we all love our dogs with their slobbery little faces and oh so cute bark (sarcasm), no body else does. To ensure we will camping at most any campground far into the future we need to make sure our dogs are as respectful as we are. 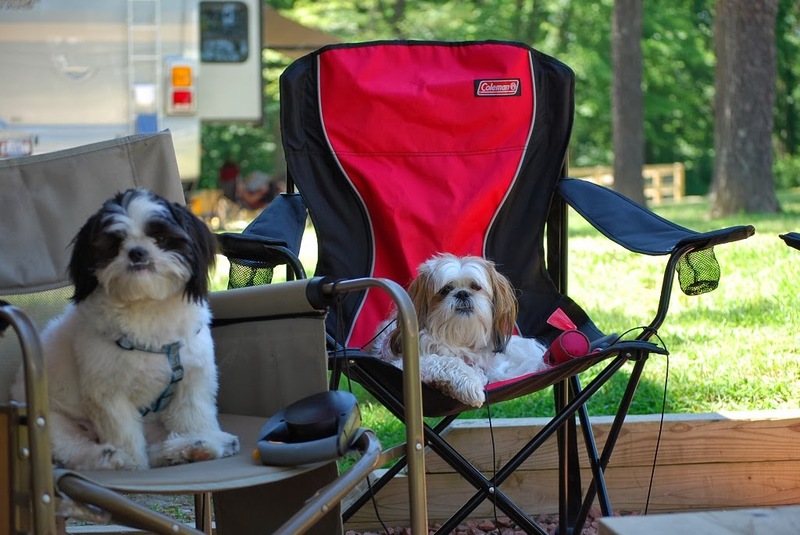 To discuss these tips for camping with pets further, please contact us at your source for RV parts and accessories . We can help provide you with a few RV specific pet accessories needed to make your next family camping trip a great one.